Water Walkers are a brilliant addition to any activity day! Step inside the ginormous bubble and make your way onto the pond! These are always a fan favourite with the kids. Water Walkers work great for family fun days, multi-activity days or as an add-on. 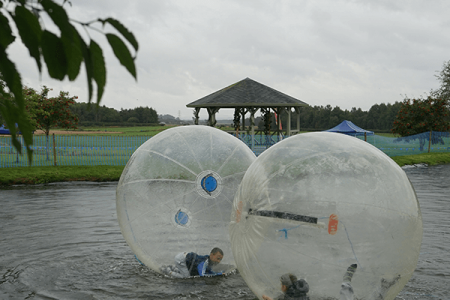 “We had the water walkers as part of our last family fun day and the queue was endless! The kids had so much fun on the Water Walkers and it was definitely a highlight for them all! Thanks so much Great Away Days for a brilliant family fun day." “We added on Water Walkers to the Jnr. It's a Knockout and it was the perfect activity combination! All the kids from the youth group were kept really busy and were all exhausted by the end of it. Each activity was safe and looked after by one of the brilliant instructors! We will be back next year."